TS Police SI PET/PMT Hall Ticket 2018: TS Police Recruitment Board announced the TS Police SI Exam on August 26th, 2018. The candidates who applied for the TS Police SI Exam are able to download the TSLPRB PET/PMT Hall Tickets in online. The aspirants to appear in the TS Police SI PET/PMT Exam have to download the TS Police SI Hall Tickets in online from the official web link @ tslprb.in. The applicants who are going to attend for the written exam have to carry the TS Police SI Hall Tickets without fail. The candidates if you fail to download the TSLPRB SI Hall Ticket he/she will not be allowed to the examination hall. To get more details just stay on this website and get more information about TS SI exam Date, TS SIPET/PMT hall Tickets from the below sections. Latest Update: Candidates can download Revised Admit Card / Intimation Letter of PMT / PET from 8 am on 5th February to 12 midnight on 9th February 2019 TSLPRB SI PET/PMT Hall Tickets are announced. Candidates download the TS SI PET/PMT Hall Tickets from the link given below. PMT / PET will be conducted at 3 Venues / Grounds in Hyderabad (for Hyderabad and erstwhile RR District Candidates) and at 1 Venue / Ground in each of the Headquarters of the other erstwhile Districts of Warangal, Karimnagar, Khammam, Mahbubnagar, Nalgonda, Sangareddy, Adilabad and Nizamabad and this process is likely to be completed within a period 35-40 working days, by the third week of March 2019. 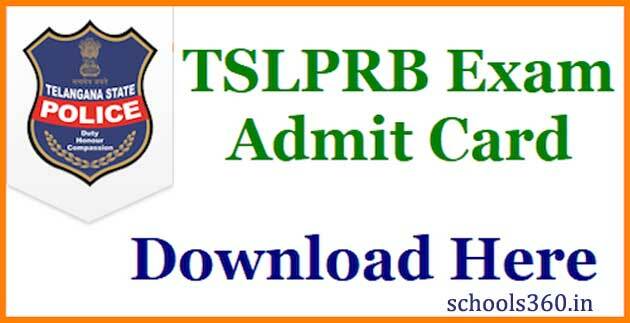 All the Candidates who have qualified for PMT / PET are informed that their individual Revised Admit Cards / Intimation Letters can be downloaded from 8 a m on 5th February 2019 onwards till 12 midnight on 9th February 2019 by logging into their respective user accounts on the TSLPRB website: www.tslprb.in by entering their credentials. Candidates whose Admit Cards could not be downloaded may send e-mail to support@tslprb.in or contact us on 93937 11110 or 93910 05006. Hello aspirants the TS Police SI hall Tickets are announced on the official website @ tslprb.in. The candidates who are eligible and who are interested and who applied for the TS SI exam are able to download the TS SI Hall Tickets now. The TS SI exam will be held on August 26th, 2018. Actually the TS Police SI Application forms were commenced on June 9th to 30th, 2018. Nearly thousands of candidates were applied for this TS Police SI exam. The TS SI written exam will be held from 10 AM to 1 PM. A huge number of aspirants who have applied can able to download the Admit cards in online from the official website given above. The authority will conduct the written exam, PST, PET. The candidates who qualified in the TS SI written test have to participate in the further rounds. We mentioned the exam dates from the below passage. Candidates must download the TS Police SI Hall Tickets to appear for the test. Venue: Hyderabad and 10 other towns across other city.